News and Insights » Do you remember Nalen? Nalen is the Cambodian farmer who wanted to lead by example for his community by installing 128 solar panels to energize his rural farm. With our help, his funding request was successfully raised on Kiva and the installation started almost immediately. 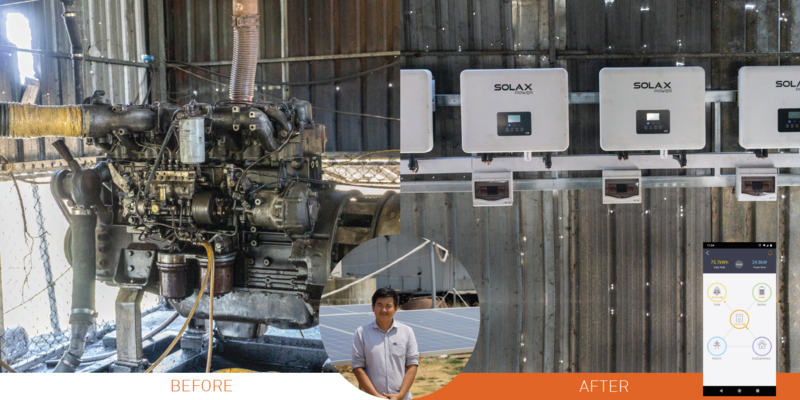 Our project team, Justin and Sarou, went back to check on the installation and were thrilled to see that the old, massive diesel bus engine that was previously powering his farm had been replaced by brand-new solar panels. Nalen was even monitoring the panels using a mobile app on his phone. Thanks again to all the KIVA lenders who joined the campaign. Let’s keep the good work together and continue to make an impact!